image credit: Tomohiro Ohsumi / Contributor / Getty Images. Upgrading to a new iPhone is pretty exciting, but don't forget to unpair your Apple Watch and iPhone first. You may be so excited about your new phone that you'll want to run right home and set up your new phone. But if you've got an Apple Watch that you used with the old iPhone, you have to unpair the two devices first to avoid problems. When you set up an Apple Watch, you connect it to your iPhone in a process called pairing. Pairing allows your Watch to get notifications from the phone and to send data like your exercise levels to the Health app on the iPhone. An Apple Watch can only be paired to one iPhone at a time (it works differently in the other direction: multiple Watches can be paired to the same phone), so you have to make sure that you've unpaired your Apple Watch from your iPhone before you can pair the Watch to your new one. If you don't, it's not the end of the world, but you will lose some data. And why lose data if you don't need to? 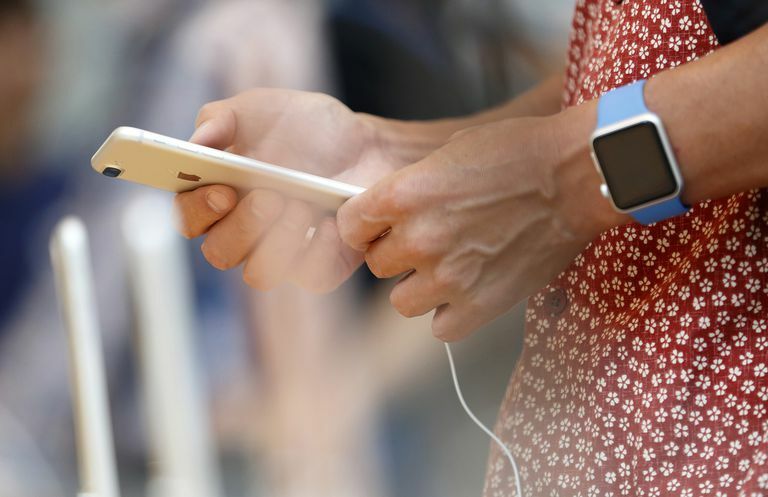 This article shows you how to backup your Apple Watch, how to unpair the Apple Watch, and then how connect your Watch and its data to your shiny new iPhone. On the old iPhone that's paired to the Apple Watch and is going to be replaced, tap the Apple Watch app to open it. Tap the i icon next to your Watch. If you have an Apple Watch model will cellular data access, you'll need to decide what to do with your monthly plan (if you have a different model, skip this step). If you plan to pair this Watch and iPhone again, tap Keep Plan. If you're going to pair a different Watch and iPhone combination, tap Remove Plan. In the menu that pops up at the bottom of the screen, tap Unpair [Watch Name]. Next, you'll be prompted to enter your Apple ID password. This is crucial, because it's used to turn off all kinds of features on the Watch, such as Activation Lock and Find My Watch. If you don't do this, you won't be able to unpair and your Watch will continue to be connected to your old phone. When you've entered your password, tap Unpair. The unpairing process begins. It will take a few minutes. When your Apple Watch reboots to the language-choice screen, you've completed unpairing it from your iPhone. One reason that the unpairing in step 10 takes so long is that the data on your Watch is backed up to your iPhone at this point. This back up can be added to a new Apple Watch if you're going to pair one to your iPhone. At this point, you should follow the standard steps to upgrade your phone: make a backup of the old phone (since you unpaired your Watch in step 8, this will include both the data from your iPhone and the data from your Watch); use an encrypted backup if you want to store secure data like Health info and saved passwords; activate the new one and restore data onto it, etc. When the new phone is set up, follow the standard steps to pair your Apple Watch to your new iPhone. The unpairing process described in the last step is pretty easy, but what happens if you upgrade to a new phone without unpairing your Apple Watch? There are two options. First, if you restore your new iPhone from backup during set up, this should also restore most or all of your Apple Watch data. However, if you set up your iPhone without restoring from a backup, you'll lose whatever data is stored on the Watch. Depending on how much data you store on your Watch, this may not be a big deal. The most common data stored on your Watch is from the Health app or data from the apps you've installed on the Watch. If you don't have this data, or don't care about keeping it, you're in the clear. On your Apple Watch, choose the Settings app. Enter your passcode, if prompted. If your Watch has cellular features, choose whether or not to keep your cellular data plan. Since you're going to pair this Watch to your phone right away, it probably makes sense to keep the plan. Tap Erase All to remove the plan or Erase All & Keep Plan. When the Watch has rebooted to the language-choice screen, tap your preferred language. On your new phone, tap the Apple Watch app to open it and set up the Watch as you would a brand-new Watch. Depending on what you want to do with the Watch at this point, you may need to remove Activation Lock. That's not necessary if you're going to pair it to another iPhone you own, but if your plan is to sell it or give it away, you should. The new owner won't be able to use it while it's still locked to your account. Learn how to remove Activation Lock using iCloud in How to Unlock iCloud-Locked iPhones.